“Ziggy's Chocolate Bar” from Christian Faith Publishing author Janet Ortbals is a fun-filled adventure featuring Ziggy the frog. When Ziggy decides to steal a chocolate bar from nearby Camp Wallypog, he is quickly caught in an adventure of a lifetime. 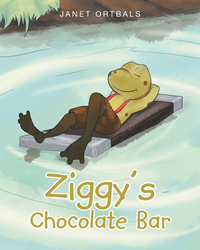 “Ziggy's Chocolate Bar”: a fun-filled adventure born from a frog’s quest for a taste of chocolate. “Ziggy's Chocolate Bar” is the creation of published author, Janet Ortbals. Published by Christian Faith Publishing, Janet Ortbals’ new book tells the tale of a curious frog named Ziggy. Ziggy was a curious frog living near Camp Wallypog. He was tired of eating the same things day in and day out. He always heard the little people at the camp talking about how delicious chocolate tasted, so he decided he had to have some. His plan seemed simply enough, but it quickly goes awry and sends the little frog on an unforgettable adventure. View a synopsis of “Ziggy's Chocolate Bar” on YouTube. Consumers can purchase “Ziggy's Chocolate Bar” at traditional brick & mortar bookstores, or online at Amazon.com, Apple iTunes store, Kobo or Barnes and Noble. For additional information or inquiries about “Ziggy's Chocolate Bar”, contact the Christian Faith Publishing media department at 866-554-0919.